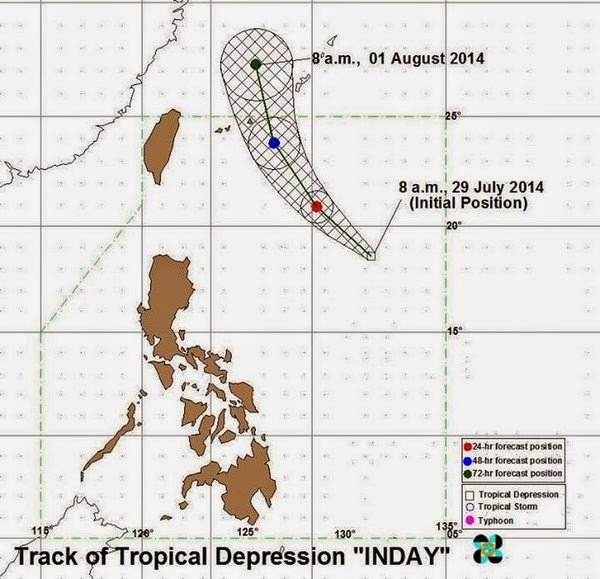 Bagyong Inday News as of Tuesday, July 29, 2014 from PAGASA: The LPA East of Appari, Cagayan has developed into Tropical Depression Inday. At 10 A.M., the state weather bureau said the tropical cyclone was spotted at 870 kilometers East of Aparri, Cagayan with maximum sustained winds of 55 kilometers per hour near the center. It is forecast to move Northwest at 15 kph. Weather forecaster said Bagyong Inday is expected to be at 690 km East Northeast of Aparri, Cagayan by tomorrow morning and at 695 km Northeast of Aparri, Cagayan by Thursday morning. By Friday morning, it is expected to be at 740 km North Northeast of Basco, Batanes. The estimated rainfall amount, according to PAGASA, is from 7.5 to 15 millimeters per hour (moderate to heavy) within the 300-km diameter of the Tropical Depression Inday, which will not yet affect any part of the country. The public and the disaster risk reduction and management council concerned have been advised to take appropriate actions and watch for the next bulletin and Bagyong Inday news updates, the weather agency added.